Robert J. Uram is Of Counsel in the Real Estate, Land Use, Natural Resources and Environmental practice group in the firm's San Francisco office. 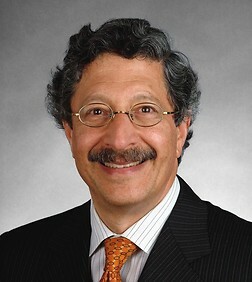 He is a founding member of the firm's Organic Food and Fiber Law group. Mr. Uram has more than 35 years of experience on wetlands, endangered species, water quality, land use, mining, public lands and Indian Law issues. He is a nationally recognized expert in the National Environmental Policy Act (NEPA), the Endangered Species Act, and the Clean Water Act. He also advises clients on organic food and fiber law, climate change and sustainability issues. Mr. Uram was recently elected as a Fellow in the American College of Environmental Lawyers and is listed in the Best Lawyers in America. Additionally, Mr. Uram was named one of the "Best Lawyers’ 2012 San Francisco Natural Resources Law Lawyer of the Year" by Best Lawyers in America. Mr. Uram has worked on wetlands, water quality, and endangered species issues on projects throughout California, including the San Francisco Bay Area, Sacramento Area, Central Valley, Inland Empire, Central Coast and Southern California. Mr. Uram played a key role in the development of Regional HCP/NCCPs in Orange County and participated in the development of the NCCP program. His clients include both private interests and local governments. Mr. Uram works on laws concerning the organic food and fiber industry. This includes the Organic Food Production Act of 1990 and the California Organic Food Act. He represents the Organic Trade Association and organic food distribution and production companies and 501(c)(3) organizations that support research to improve organic farming. With the assistance of his partners, he represents these organizations on a broad range of national policy issues, including organic compliance, corporate, contract, labor, and intellectual property issues. President Clinton appointed Mr. Uram as Director of the Office of Surface Mining Reclamation and Enforcement in 1993. He served in that post until September 1996. Prior to this post, Mr. Uram was a partner at McCutchen, Doyle, Brown and Enersen in San Francisco. He also worked at the Department of the Interior (1973-1983), where he advised the Bureau of Land Management on federal land use planning and mineral development, oil and gas leasing and Indian law. From 1979 to 1980, Mr. Uram served as the Associate Solicitor for Surface Mining, where he served as chief counsel for the Office of Surface Mining Reclamation and Enforcement. From 1983 until 1985, Mr. Uram was Counsel and Partner at White, Koch, Kelly & McCarthy in Santa Fe, New Mexico. His practice included representing clients in water law, zoning, timber and mining issues. Mr. Uram frequently lectures on wetland, endangered species, mining, and organic food and fiber law issues. AV® rating, Martindale-Hubbell®. This is the highest rating an attorney can receive for legal quality and ethics. Represented Solar developer on utility scale projects in Imperial County. Represents the developer of a 20,000 unit master planned community in Los Angeles County and obtained a Section 404 permit for the project. Represented the developer for a master planned community on Section 404, endangered species, and water quality issues in the Walpert Ridge area of the Hayward hills. The project consists of 614 homes, featuring a championship golf course and Hayward's first new public elementary school in 40 years. Represented the developer of the El Sobrante Landfill in Southern California on the preparation of a Multiple Species Habitat Conservation Plan. Represented a developer in San Ramon in obtaining approvals from the U.S. Army Corps of Engineers, the U.S. Fish & Wildlife Service, the California Dept. of Fish & Game and the California Regional Water Quality Control Board for this community of 5,000 homes. Represented the City of San Francisco on wetlands and endangered species issues related to the proposed expansion of the San Francisco Airport. Represented a large master planned community, consisting of 1,980 residential units, a town center, shopping center, a resort complex and two golf courses in obtaining authorizations from the U.S. Army Corps of Engineers, the Regional Water Quality Control Board and the Dept. of Fish & Game, and successfully defended the project in federal litigation challenging the Corp's permit. Represented the developer on numerous projects in the City of Irvine in obtaining authorizations from the U.S. Army Corps of Engineers, the Regional Water Quality Control Board and Department of Fish and Game. Represented the City of Los Altos on wetlands jurisdictional issues. Advised the Organic Trade Association on the rulemaking that established the National Organic Program at the U.S. Department of Agriculture. Advises organic food and fiber manufacturers and related entities on compliance with the National Organic Program, and advises clients on issues related to the effect of genetically modified organisms. Litigated a dispute between joint venturers over the operation of a gold mine. Litigated a dispute charging an oil and gas lessee with failure to prevent drainage from an oil and gas lease. Represented the City of Las Vegas, New Mexico, on water rights litigation and timber sale issue. Represented client in a dispute over title to sand and gravel and a claim for trespass by the surface owner against the operator of a sand and gravel mine. Represented clients who received "cease and desist" orders from the Army Corps of Engineers based on allegations of placing fill into waters of the United States without a permit. Represents an Indian Tribe in a dispute over tribal membership and authority. Challenge in managing the demand for the use of public lands for wind and solar development. Uram, R., "The Evolution of the Practicable Alternatives Test," Natural Resources & Environment, American Bar Association, Vol. 7, No. 1, Summer 1992. Uram, R., Chapter VIII Federal And State Wetland Regulation and Chapter IX Endangered Species Act, Curtin, "California Land-Use and Planning Law." Uram, R. "Recent Developments Under the National Environmental Policy Act: Integrating Nepa with Federal Requirements." CLE International NEPA Conference, January 2012. Uram, R. and panel. "Working through the Permitting Phase for Energy Projects: Noteworthy Challenges and Outcomes." Law Seminars International, 2011. Uram, R. "Putting the Pieces Together: Integrating NEPA with Other Federal Requirements." CLE International NEPA Conference, 2010. Uram, R. and panel. "The Future of the Waterfront and Contiguous Land," Bay Planning Coalition's 22nd Annual S. F. Bay Decisionmakers Conference, “Sustainability Strategies for a Changing Bay," 2009. Uram, R. and panel. "New Rules for Compensatory Mitigation Under Clean Water Act Section 404." Lorman Education Service Teleconference, 2009. Uram, R. "Endangered Species Act Enforcement: Conflicts of Interest, Duty of Confidentiality, and Liability Issues." CLE International ESA conference, 2008. Uram, R. and panel. "State Wetland Policy?" Urban Water Institutes Seventh Annual Clean Water Conference, 2008. Uram, R. and panel. "Conservation Planning and the Law: Key Legal Issues That Will Shape the Future Development and Implementation of HCP/NCCPs." The Northern California Conservation Planning Partners Sixth Annual Workshop, 2008. Uram, R. "Special Area Management Plans/Master Streambed Alteration Agreements (SAMP/MSAA) – Watershed Approaches to Permitting." CLE International Wetlands Conference, 2005. Uram, R. "Status of the California Tiger Salamander." CLE International ESA Conference, 2005. Uram, R. "Overview of Wetlands Regulation." CLE International Wetlands Conference, 2004. Uram, R. "Permitting Requirements & Options under the Endangered Species Act." CLE International ESA Conference, 2003. Uram, R. "The Essential Elements of a Biological Opinion." CLE International ESA Conferences, 2002 - 2003.